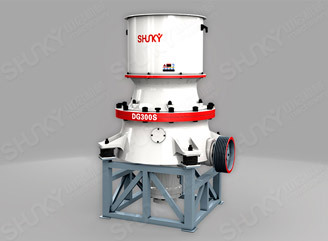 DG series single-cylinder hydraulic cone crusher is mainly composed of upper bracket, middle bracket, bottom bracket, movable cone, eccentric sleeve, transmission and hydraulic cylinder. The whole working process of this machine is that motor drives rotation of horizontal axis, horizontal axis drives the rotation of eccentric sleeve through the spiral bevel gear, and then eccentric sleeve would drive the rotary oscillation of movable cone so as to realize the continuous extrusion. The adjustment of hydraulic cylinder at the bottom of movable cone can drive main shaft thus driving movable cone move up and down to easily adjust the space of movable cone and the lining plate of fixed cone, then the product size will be controlled. Hydraulic cylinder also has the function of overload protection. When materials that cannot be crushed (such as iron) enter into crushing chamber, the accumulator will be triggered, then the hydraulic cylinder will drop movable cone to release the iron and recover normal crushing automatically, which can protect the crusher perfectly. 2. Good product shapes and large production capacity. The machine adopts the principle of laminating crushing, which improves product shape to be cubic. The reasonable coordination of eccentricity, cavity shape and parameters greatly improves the production capacity and efficiency of the equipment.